We’ve finally gotten some rain here in southeastern Pennsylvania, along with a brief respite from temperatures in the 90s and 100s, so the plants have perked up just in time for a quick Bloom Day photo shoot. I could easily fill a whole post with pictures of my new favorite plant: ‘Jade Princess’ millet (Pennisetum glaucum). I love the form, and the flower and foliage colors too. I’d like to see it with a little more height – maybe to 24 to 30 inches, instead of the 18 it has reached so far – but otherwise, it’s just lovely. There’s a lot of hot color going on in the front garden – some of it from flowers but much from some great foliage, such as the ‘Bright Lights’ chards. Above is a red one with ‘Gartenmeister’ fuchsia, ‘Purple Knight’ alternanthera, and ‘Profusion Orange’ zinnias; below is a pink one with ‘Limerock Ruby’ coreopsis and a bit of purple fountain grass (Pennisetum setaceum ‘Rubrum’). I love globe amaranths (Gomphrena) and plant them every year, but they usually don’t seem very happy here. They’re thriving this year, though. 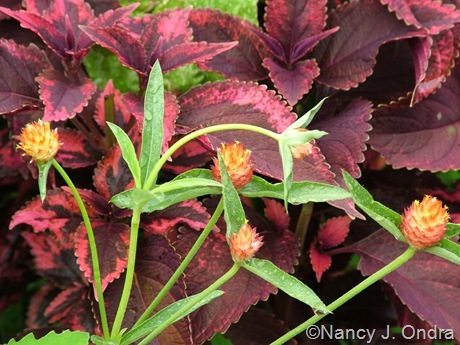 Below is ‘Rainbow Orange’ globe amaranth with ‘Religious Radish’ coleus (Solenostemon scutellarioides). One red I can always depend on is ‘Lady in Red’ Texas sage (Salvia coccinea). The plants I started indoors are at their best in July and August; then the self-sown ones take over for September and October. 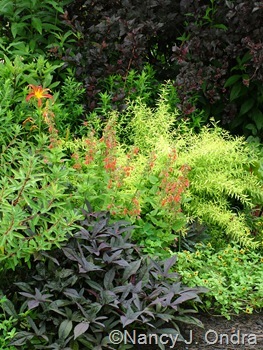 Above, ‘Lady in Red’ is mingling with ‘Sweet Caroline Purple’ sweet potato vine (Ipomoea batatas), ‘Fireglow’ euphorbia, ‘Nona’s Garnet’ daylily (Hemerocallis), Diabolo ninebark (Physocarpus opulifolius ‘Monlo’), Mellow Yellow spirea (Spiraea thunbergii ‘Ogon’), and ‘Mandarin Orange’ creeping zinnia (Sanvitalia procumbens). 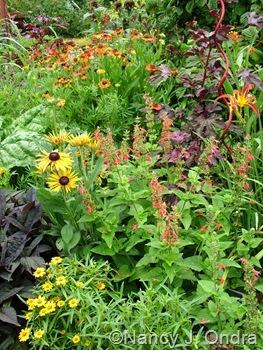 Below, it’s with ‘Classic’ narrow-leaved zinnia (Zinnia angustifolia), ‘Sweet Caroline Purple’ sweet potato vine, ‘Chim Chiminee’ Gloriosa daisy (Rudbeckia hirta), ‘Coppelia’ sneezeweed’ (Helenium), ‘Red Shield’ hibiscus (Hibiscus acetosella), and ‘Nona’s Garnet’ daylily. 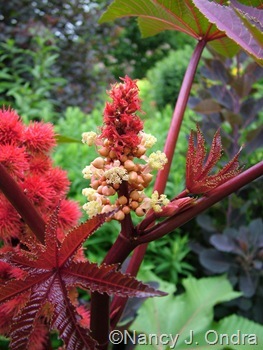 Above, the very cool inflorescence of ‘Carmencita Red’ castor bean (Ricinus communis), with the spidery red stigmas of the female flowers at the top and the cream-colored stamens of the male flowers along the lower half. 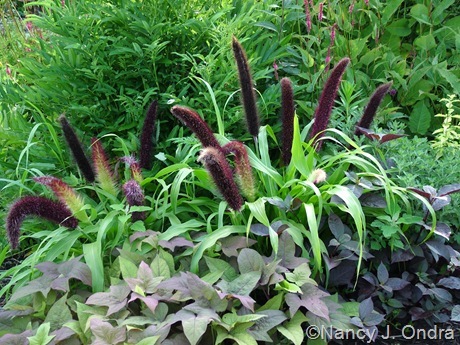 Below, a foliage-focused combo of ‘Chocolate Mint’ coleus and ‘Jester’ millet (Pennisetum glaucum). While we’re talking about millets, I can’t resist tossing in another shot of ‘Jade Princess’, this time with an unnamed sweet potato vine and ‘Purple Knight’ alternanthera. A few more foliage shots: above, ‘Sedona’ coleus with ‘Purple Lady’ beefsteak plant (Iresine) and ‘Empress of India’ nasturtium (Tropaeolum majus). 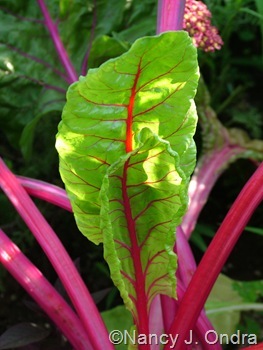 Below, ‘Neon Glow’ Swiss chard. 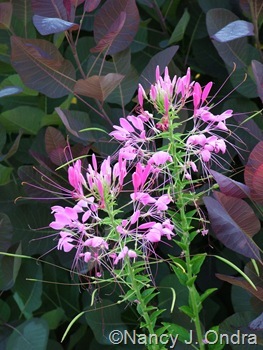 There are a lot of other pinks around now too: above, ‘Cherry Queen’ cleome against ‘Grace’ smokebush (Cotinus); below, ‘Erica’ Culver’s root (Veronicastrum virginicum) against a self-sown phlox. Above, ‘Carin’ Joe-Pye weed (Eupatoriadelphus [Eupatorium] maculatus); below, purple coneflowers (Echinacea purpurea) with ‘Indian Steel’ Indian grass (Sorghastrum nutans), Joe-Pye weed, and cut-leaved sumac (Rhus typhina ‘Laciniata’). 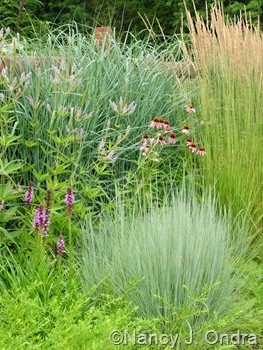 Below, even more purple coneflowers, this time with ‘Karl Foerster’ feather reed grass (Calamagrostis x acutiflora), ‘The Blues’ little bluestem (Schizachyrium scoparium), aromatic aster (Symphiotrichum oblongifolium), spike gayfeather (Liatris spicata), ‘Temptation’ Culver’s root, and ‘Dewey Blue’ switch grass (Panicum amarum). 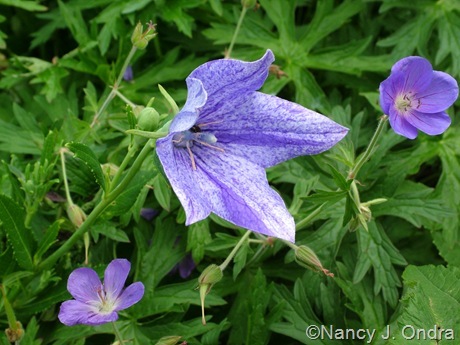 Below, ‘Axminster Streaked’ balloon flower (Platycodon grandiflorus) and ‘Brookside’ geranium. 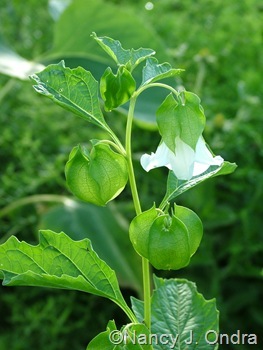 The balloon flower is easy to grow from seed and most of the seedlings have blue-and-white flowers, though the exact coloring patterns vary from flower to flower. 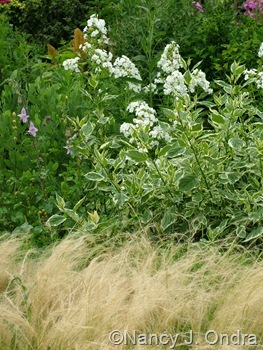 A couple of whites: Above, white-flowered shoo-fly plant (Nicandra physalodes); below; ‘David’ phlox with ‘Silver and Gold’ yellowtwig dogwood (Cornus sericea), ponytail grass (Stipa tenuissima), and African foxglove (Ceratotheca triloba). 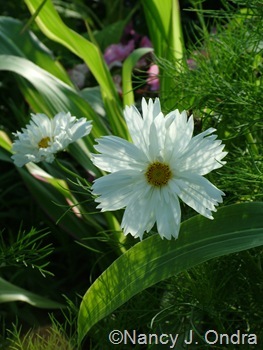 Above, ‘Psyche White’ cosmos and ‘Quadricolor’ corn (Zea mays); below, bells-of-Ireland (Molucella laevis). Above, ‘Sunspots’ sunflower (Helianthus annuus); below, common mullein (Verbascum thapsus) and false hemp (Datisca cannabina). 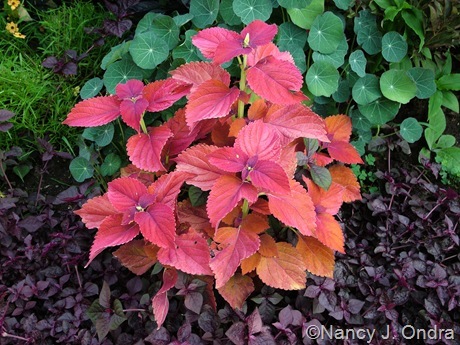 And to finish: above, ‘Grace’ smokebush (Cotinus) and ‘Golden Foam’ euphorbia; below, ‘Autumn Touch’ amaranths (Amaranthus). 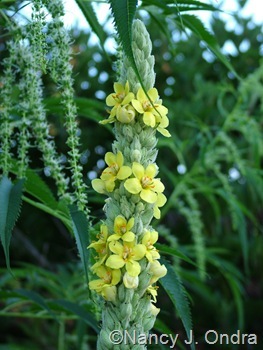 To see what’s blooming in other gardens today all over the world, visit Carol’s Bloom Day post at May Dreams Gardens. WOW! The colourmix in your garden are superb!! Thanks, Susie. We’re coming to my favorite time of year, when I can finally see if the combination ideas I had at planting time are going to work or not. On the whole, things seem to be coming along nicely. I found many ideas for new plants in my borders, something that is still missing. Ihihihih! 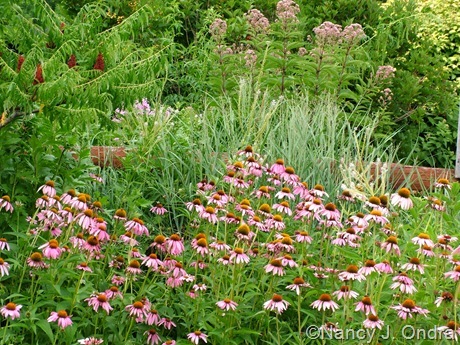 I too have the Eupatorium almost flowery looking at your pictures I thought I’d combine them for next year a part of my Sedum Autumn Joy (I seem to see in the distance in photos) and Echinacea that I love and Pennisetum. Yes yes, your posts are always inspiring. Glad I could show you something you don’t already have, Tiziana. 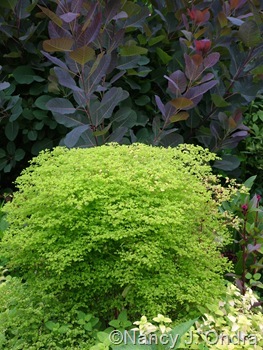 I like the idea of echoing the Joe-Pye color and form with ‘Autumn Joy’ sedum, though you ‘d probably want to prune the Joe-Pye pretty heavily to keep in shorter and somewhat more in scale. 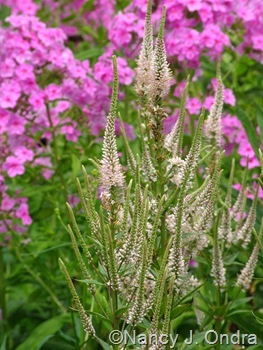 Or, maybe try ‘Little Joe’, if you can get it; it can still get over 5 feet if left alone but stays closer to 3-4 feet if the soil is somewhat dry, or if you cut it back by half in late spring. Nan, breathtaking as always. Everyone of these photos are beautiful. I especially love the first photo but I had no luck with Millet I don’t think it gets warm enough for them here. You’re probably right about the heat, Sylvia. We’ve certainly had plenty here this year, but I remember that the millets were disappointing last year when we had a relatively cool, damp summer. I just love all this color and texture. Happy GBBD. Thanks for visiting, Lisa. Happy Bloom Day to you too! Glad you’ve gotten some relief from the heat wave. My son is an archaeologist working in the Hamlin area right now. You are a true designer of amazing combinations. Do you just go outside and stare for hours at all of your glorious creations? :-) I can see why you love that millet so much. Do the birds not eat it? I’m sure the Goldfinches would be all over it here! I wish there was a way to comment beneath each photo on a blog! I keep seeing helenium blooms that I love, so I’m just going to have to add it in with my agastache ‘Navajo Sunset’ for next year. I don’t spend much time outdoors looking at combinations; I mostly just dash out with the camera at dawn or in the evening and then retreat back indoors. But I do have a great view of the front garden and the courtyard from my office and spend more time than I should staring out of the windows. The ‘Jade Princess’ millet is supposed to be sterile, so I guess there aren’t any seeds. The finches are currently busy demolishing my Rudbeckia maxima anyway. 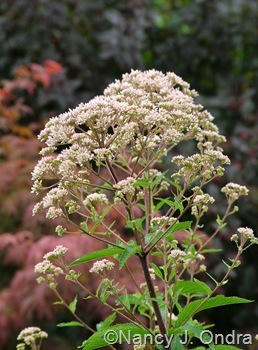 Yes, somehow I missed the eupatorium name change until last week, when I was doing some research for my new book. At least the new name isn’t hugely different from the old one, as it is with Dicentra spectabilis – now Lamprocapnos spactabilis. Arrgh. I need to get a notebook out and write down everything from this post! That euphorbia is fantastic. I can definitely see why you like that pennisetum. Does limerock ruby come back for you? I planted a limerock something or other last year that never returned. Isn’t that ‘Golden Foam’ euphorbia great? I got the seeds from Plant World last year. It’s been a frothy mound of chartreuse for over a month now. 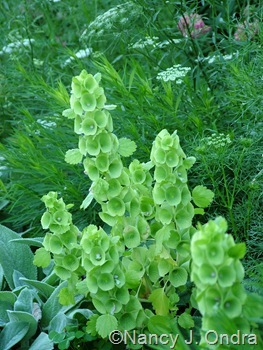 My only concern is how aggressive it might be at self-sowing, as many euphorbias can be. I wouldn’t mind having more of it, but, uh, not *too* much. Guess I’ll find out! No, none of the Limerock series coreopsis are hardy here, but I like Dream and Ruby enough to grow them as annuals. I can’t decide what I like best, it’s all so fantastic. Maybe the Platycodon, because I’ve never seen one like that before. Love the ‘Jade Princess’ Millet. I’m seeing that in a container on blocks tucked in there to give it height. The ‘Axminster Streaked’ platycodon came from the Hardy Plant Society/Mid-Atlantic Group’s Seed Exchange. I’ll try to remember to collect seeds of mine in case anyone wants some. Good idea about trying the millet in a container. Since other millets get much taller, I hadn’t even considered trying this one in a pot. But then, it would have taken a LOT of watering this summer. I love your colors and combinations. They are just spectacular. 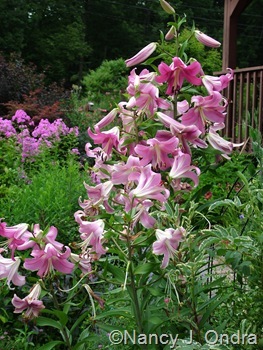 I really like the lily “Robina” and have made a note of it. Do you know a source for it? 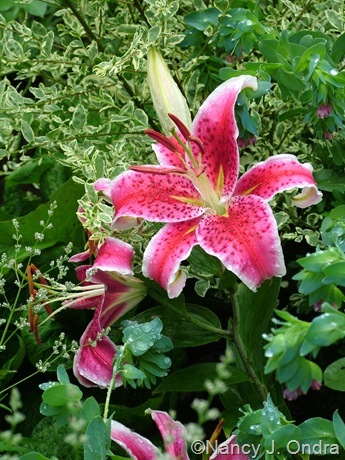 The color of that lily is washed out due to the heat this year, but it’s still pretty, and the scent is very heavy. But best of all, its stems are more like trunks – no staking needed. It came from Brent and Becky’s Bulbs. 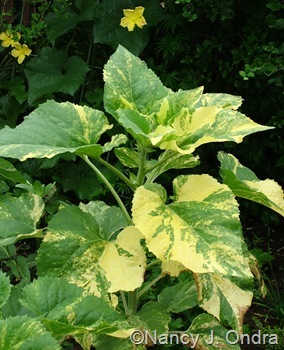 I first fell in love with the foliage; it was a bright chartreuse earlier in the season. The leaves are now more on the green side, but oh, those spikes: they start out chartreusey and red and then darken to that wonderful chocolate brown. As always, your post is chock full of inspiration. 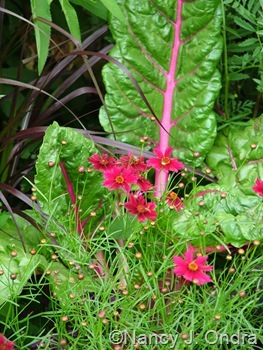 My biggest take-away today has to be using Swiss chard in my perennial beds. I picked some Swiss chard and lettuce today and was marveling, again, at the colors of the Swiss chard stems. After seeing it in your post it seems like a no-brainer to use it in a purely ornamental fashion. Chard is one of my favorite fillers, Debbie. I find that ‘Bright Lights’ provides the widest range of colors. It’s pretty easy to tell the stem colors when the seedlings are just an inch or so tall, and I keep only those with the richest colors. ‘Neon Glow’ has also provided some strong pinks and yellows, but some of the pink seedlings turned out kind of pale and have been a little disappointing. I sowed a new batch of ‘Bright Lights’ a few weeks ago and plan to use those plants in any gaps that are evident later this month, for late-season color. So glad you ID’d that chartreuse froth in the first photo and again in the last photo. Will check out the Plant World catalogue. Now anxiously awaiting wide release of Jade Princess! Fabulous July bloom day post. It was pure luck that I scored some ‘Jade Princess’ this spring, Denise. I too hope that it will be widely available next year, since saving seed won’t be an option. Your combinations are wonderful, Nan. I did not plant gomphrena this year and now I wish I had … and I love to let common mullein self sow. I rarely remove it from its place of choice. 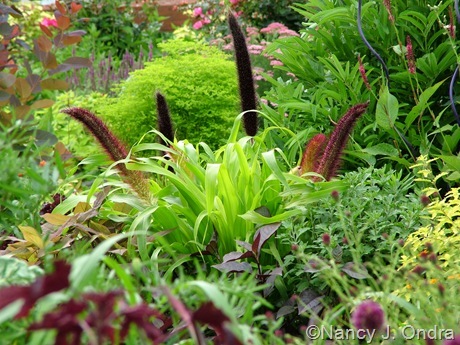 Not only are the tall flower spikes a great addition, the large fuzzy leaves add great structure and texture. Goldfinches like to peck at the seen heads around here. Count me as a fellow mullein fan, Joene. I rarely have luck with the fuzzy-leaved kinds when I try to cultivate them, but these “common” ones have a knack for putting themselves in perfect spots and thriving. Wow, my head is reeling. Everything looks so fresh and fabulous and some of those color combos are outstanding. 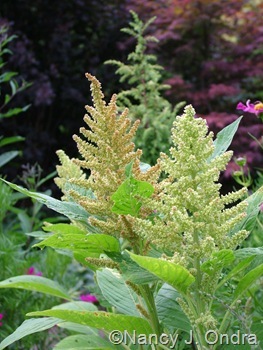 The ‘Chocolate Mint’ coleus and ‘Jester’ millet combo is striking, though I love that coleus just for itself. I agree, the purple millet is really lovely. Thanks, Nicole! 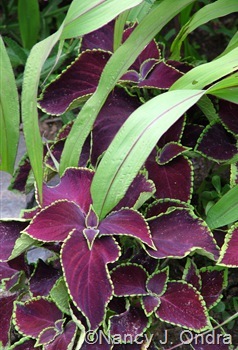 That ‘Chocolate Mint’ coleus came from seed. It turned out to be beautiful, but I’ll admit that I bought it just because I liked the name – along with ‘Chocolate Splash’ coleus and ‘Chocolate Smoke’ flowering tobacco (Nicotiana). Ack, you’ve made me blush, Dee. You’re very kind. Thanks! What a feast for the eyes! I especially like the ‘Religious Radish’ coleus. It’s very pretty, but it’s also worth growing just for the silly name! 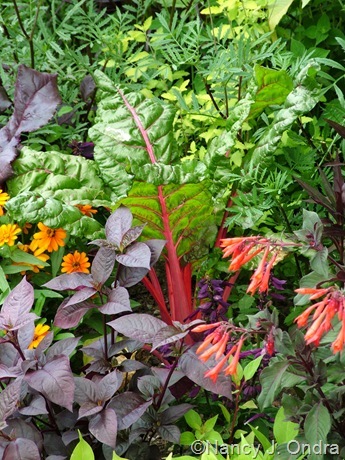 Lots of beautiful, rich, saturated color in your plant combinations. Love the Jade Princess. Thanks for visiting, Rhonda. Happy Bloom Day! I was just looking at my new Fine Gardening magazine and I thought I recognized that garden on the cover. It is so beautiful! Cool! I haven’t seen it yet. It is always a special treat to see the pictures on your bloom day post. A real education in the great variety of plants and flowers that are available and do well in Zone 5. Thank you once again for joining in! Thanks, Carol. I just realized that I’ve been forgetting to leave a link over at your Bloom Day posts. I promise to remember for next month.